You don’t get to choose your relatives—some may judge you, some will support you, and others might struggle with addiction just like you do. Whether you like it or not, you have a history with your family that you can’t change. Acknowledge your past, but build for the future. 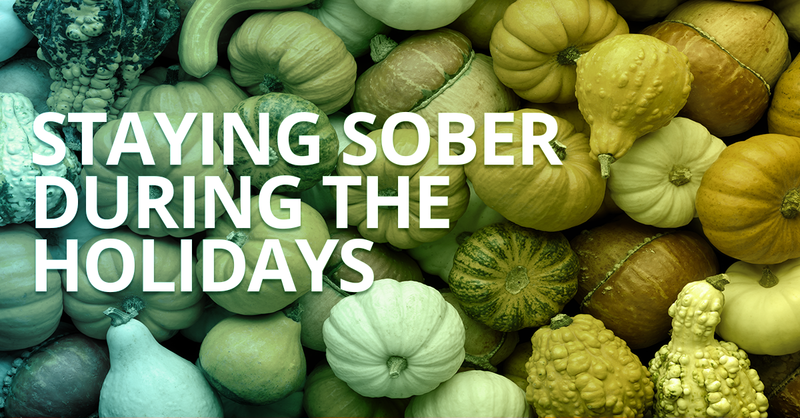 If you know your family or friends will be drinking at the holiday gathering you’re attending, give yourself a mission to keep yourself distracted. This could be learning the names of all your relative’s pets, giving your in-laws a sincere complement, or helping the host cook or clean. Likewise, if you’re visiting your hometown, stay away from the usual suspects who will try to goad you into using or drinking and places where the temptation is too great to manage. If you decide that it’s best to skip the family plans this year (and it’s OK if you do), make it a point to meet up with friends or attend extra support group meetings. You don’t have to spend the holidays alone—reach out to others on addiction forums, write a pen pal, or meet up with colleagues from work. Time off from work can leave you feeling idle and tempt you to use out of boredom. Use this time for something productive, like starting a new hobby or project. Remember to give yourself deadlines and hold yourself to them. If you feel like taking it easy, reacquaint yourself with the movie theatre—many are open year-round, even on Christmas. During your time off, you may start to feel listless or anxious. Remember to take care of yourself and focus on your health. Pay close attention to your diet and don’t skip meals! This can lower your blood sugar, causing irritability and impulsiveness—the perfect combination for a relapse. With the holidays comes pressure to give the perfect gift—if you don’t have the budget or the resources to find the right gifts, or if you feel pressure to compete with your family’s more aggressive gift-givers, agree to hold off on a gift exchange this year or establish a few giving guidelines with whomever you’re exchanging presents with. These could include a spending cap, or requesting that any gifts be handmade. You can also elect to do a white-elephant gift exchange where the presents are all second-hand items that come from your house. As the season comes to an end, reflect on how everything went. Did you stick to your goals? Did you find positive ways to cope with temptation? Did you relapse? Be honest with yourself and write down your thoughts on paper—don’t keep it inside. Afterwards, create deadlines for your goals and add them to a personal calendar. Cross them off your calendar as you complete them, making sure to reward and thank yourself. At the end of the year, you can then flip through your calendar and see what you followed up on, and what you fell behind on. Was there a time in your life when advice helped you overcome temptation? Use your voice to help others who are struggling this holiday season and share your story here.